Too Young for a heart attack or stroke? Think again. Heart disease is the leading cause of death in the United States, killing more than 800,000 people in the U.S. each year. 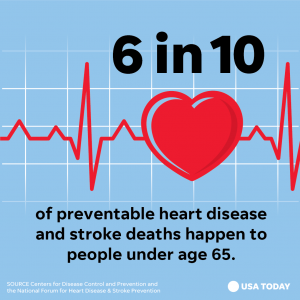 But heart attacks and strokes don’t just happen to the elderly. New research shows that heart disease death rates are declining more slowly than they have in the past, especially among adults age 35 to 64. In many communities across the U.S., cardiovascular disease death rates are increasing among adults age 35-64 and their rates of risk factors, such as physical inactivity, tobacco use and hypertension, are also increasing. To prevent heart disease and stroke, young adults should take heed of their risk factors and work to control their blood pressure and cholesterol levels, as well as maintain a healthy lifestyle by eating healthy, being physically active and avoiding tobacco.